I've made my obsession with pimento cheese abundantly clear on here, so no need to rehash that. Therefore, I'll just get right to the point and share yet another dish that's a variation of pimento cheese. One night for whatever reason, my planned dinner wasn't happening, so I was scrounging. It's times like this when I fall back on pantry staple meals so we don't succumb to take-out or delivery pizza. When I think of pantry staple meals, pasta is always a safe bet for me. 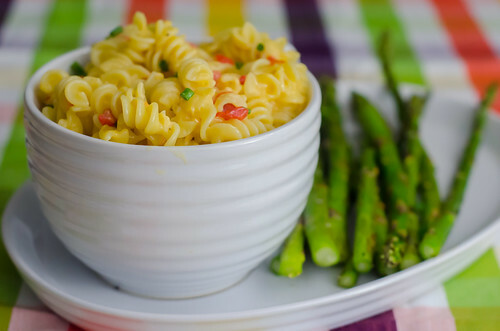 We always have dried pasta of some sort and several random cheeses in the fridge, so some variation of macaroni and cheese is usually the fallback. Especially considering that it is Caroline's absolute favorite food in the whole world (her words). You can never have too many versions, right? I used this creamy stovetop macaroni and cheese as the base recipe, adjusting the ingredients to the flavor profile I was going for. The final product was just what I wanted: supremely creamy and cheesy with just a little kick. And it was ready and on the table in under half an hour. You can't beat that! Bring a large pot of salted water to boil and cook the pasta to al dente, according to the directions on the package. Drain the pasta, reserving 1 cup of the pasta water (I used to always forget to save the water, so now I put a measuring cup in the strainer while the pasta is cooking, so I don't forget). Return the pasta to the pot and stir in the garlic, worcestershire sauce, and red pepper flakes. Add the cheese a handful at a time, stirring well between each addition. Stir in the Greek yogurt, butter, and milk, and stir until all the cheese has melted and the sauce is creamy and smooth. Stir in the pimentos, season to taste with salt and pepper and garnish with chives before serving. I have that towel from C&B! 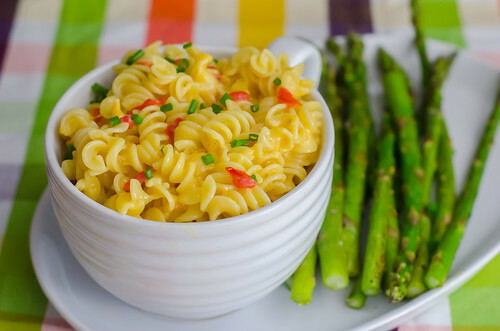 I am totally on board with this mac and cheese by the way. Absolutely genius. This is so filled with goodness. Yum! Anything that you post with the words "pimento cheese" immediately has my attention. This looks so darn good! Between this and Annie's latest post, I'm convinced the universe wants me to make mac and cheese. This looks amazing! I love the pimento twist...it definitely breaks up the heaviness a bit! I love the noodles you used! Sheer genius. I have a developing love for pimento cheese ever since I discovered it, so I'm excited to try this new twist on it.